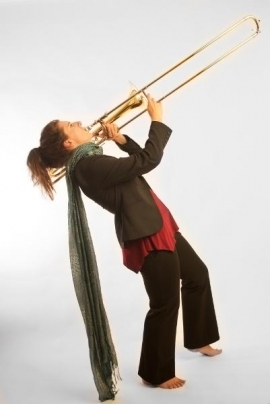 Jen Baker, trombonist and improviser, advocates for new music through collaborations with dozens of artists, solo commissions, and performances in numerous ensembles that often feature multimedia aspects. In addition to performances in Anthony Braxton’s Tri-Centric Festival, Avant Music Festival, and SEM’s Ostrava in New York Festival, she has appeared in festivals internationally and nationwide with new music ensembles S.E.M., TILT brass, and other groups at the Guggenheim, Lincoln Center, the Met Museum, and Barclays Center. A sought-after improviser, her work in multimedia and contemporary chamber music has led her to performance with Merce Cunningham Dance Company, Karole Armitage, Brooklyn Ballet, and a world tour with the experimental theatre work, Beowulf. As a composer, Ms. Baker has written 3 and 4-dimensional pieces, including a collaboration for First Nation’s Ley-a Concerto for Multiphonic Trombone, which has also been performed as a telematic piece. She is interested in assisting the body’s (as well as the Earth’s) natural ability to heal itself and composes solos for this purpose. She also writes for a variety of ensembles, including her soon-to-be-famous Mikro Trio and the Brooklyn Infinity Orchestra. Among many recordings, she is featured on the soundtrack to Werner Herzog’s Oscar-nominated Encounters at the End of the World, and can also be heard on Blue Dreams, an album of her own solo multiphonic compositions and improvisations. Ms. Baker grew up on a dairy farm in a small agricultural/factory town in Michigan.